On 13th April 2017 (31st Chaitra 2073), A day before Nepalese New Year 2074, we officially released the first Beta version of Election Nepal Portal in collaboration with Code for Nepal and made it open for contribution. Election Nepal in a crowdsourced citizen engagement portal which will include Local Elections data which is going to be held in Nepal at 31st of Baisakh, 2073 (14th May, 2017). The project will present a different type of data generated before and after the election in interactive visualization which can be easily understandable to the local people even with low digital literacy. 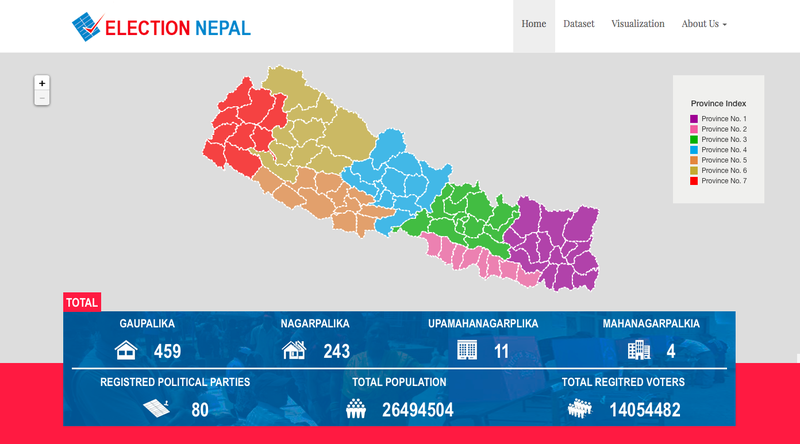 The portal will also work as a hub for election data, the datasets included in Election Nepal portal will be completely in machine-readable format, which can be easily reused. In Visualization, users can access different kinds of interactive visualization and infographics regarding the federal-state division, before and after election data etc. Users can also submit their data visualization in the portal for publishing which can be accessible worldwide to reproduce them. 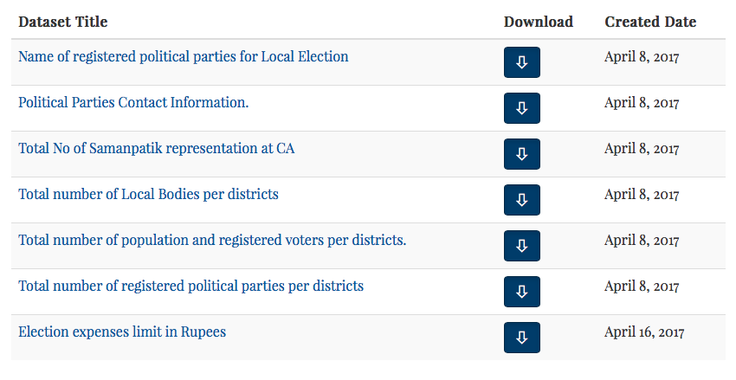 In Datasets, users can download and access data related to the election such as the number of political parties pre-districts, the number of local bodies, election areas, results, candidates and much more in CSV format, which is most commonly used machine readable format. Twitter feed will bring together different kinds of buzz happening on social media about Local Election. The project will run for six months, until the end of Local Election. It will contain all data generated during the Local Election in an open format. The Election Nepal project team will scrap, analyze and publish all the data published by Election Commission Nepal and others agencies regarding the election and will publish them in open format. The main aim is to make those data accessible to concerned people, and organization so that they can reproduce those data into different forms and apply in their research. For More Information and Contribution please visit the project website or feel free to contribute code to this project. Also, read the story of how it all started from here.